A young girl is murdered in Manchester town centre one evening. Police arrive at the scene and soon realise all is not what it seems. Alley, the murder victim is a transgender woman. Could this be a hate crime? The officer in charge of the case a detective named Donna has to put all her training into action to solve this crime in a sensitive manner and ensure all her fellow officers do the same. Being part of the LGBT community myself, this book is close to home for me. 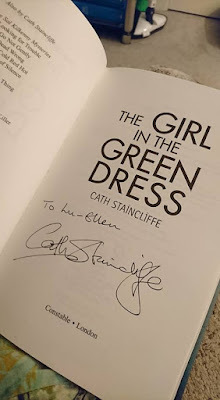 I have to praise Cath Staincliffe for how well she has written this book and how well she has highlighted the issue of hate crimes within the LGBT community. The story is wonderfully written, extremely interesting and keeps you hooked from the very beginning. I found I didn't like the character of Jade and I found myself questioning how she ever made it into the police force with an attitude like she has but at the same time I also found myself impressed with the way she was determined to find the truth and solve Alley's murder. Without giving away any spoilers I thought the plot twist towards the end of the book was a very good one and one I did not see coming. All in all a fantastic read.